Terriers rallied from an early 2-0 deficit to defeat #15 BC, 7-4, at Conte Forum in the 275th meeting in a rivalry that began a century ago in the 1917-18 season. BU’s offense was led by a pair of goals from captain Brandon Hickey, four assists by Patrick Harper and a career best three-point night (1G,2A) from Shane Bowers. With the victory, BU has now won four consecutive regular-season meetings with its arch-rivals for the first time since winning 11 straight from Dec. 9, 1992, to March 4, 1995. After BC goalie Joe Woll stopped a 3-on-1 rush and a Brady Tkachuk breakaway, BU halved BC’s lead midway through the period on Hickey’s slapshot from the right point, assisted by freshmen Logan Cockerill and Bowers. Three minutes later Cockerill pulled BU even, deflecting home a Bowers centering pass with an assist also going to Harper. 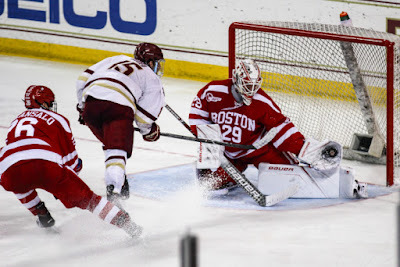 Late in the period with BC on a power play, Tkachuk collected a clearing pass by Jordan Greenway behind the Eagle defense and broke in on Woll, beating him high to the glove side for a 3-2 Terrier lead. Brien Diffley picked up the second assist. In the final seconds of the first, Bobo Carpenter broke in and nearly added a fourth goal. BC evened the score early in the middle period on Greco’s second goal, but the tie didn’t last long. 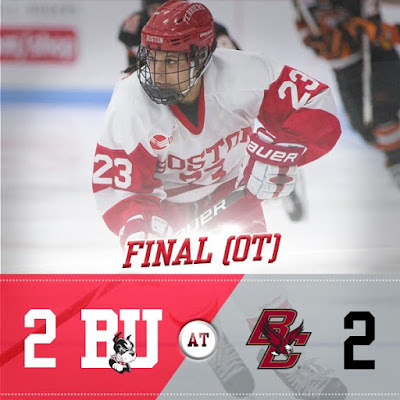 On a power play, Harper corralled the rebound of Chad Krys’ shot and snaked a pass back through traffic to the sophomore defenseman who one-timed a shot from the left circle past Woll for a lead BU would not relinquish. Just two minutes later, Hickey connected for his second of the game, picking up a loose puck in the slot and whipping a shot past Woll on a delayed penalty. Tkachuk and Drew Melanson earned assists. On the ensuing power play, the Terriers needed just 47 seconds to find the net again. From behind the goal line, Harper set up Carpenter for a wrister from just outside the crease for a commanding 6-3 lead. The Eagles got one back on a power play in the final minute of the period when Julius Mattila ripped a one-timer past Oettinger from the right circle. BU killed a BC power play to open the third period. After the teams had combined for ten goals in the first 40 minutes, the only score in the third period was Bowers empty-netter off Harper’s fourth assist of the night. The Terriers and Eagles will complete the home-and-home series tonight at Agganis Arena where BU’s 1978 national championship team will hold its 40-year reunion. Puck drop is at 7 p.m.
2019 recruit Alex Vlassic scored a power play goal, while Trevor Zegras assisted on two goals and Case McCarthy added a helper in the NTDP U17s’ 6-3 win against Fargo. 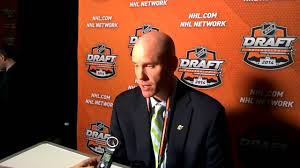 The Nashville Predators have promoted former Terrier Jeff Kealty to Director of Player Personnel. A member of BU’s 1995 national championship team, Kealty had been the Predators’ chief amateur scout. In his new position he’ll work closely with GM and former Northeastern Husky David Poile and Assistant GM and former Terrier Paul Fenton. Evan Rodrigues scored his third goal for Rochester, which dropped a 5-4 decision to Hartford. He has seven points in seven games since returning from an injury. 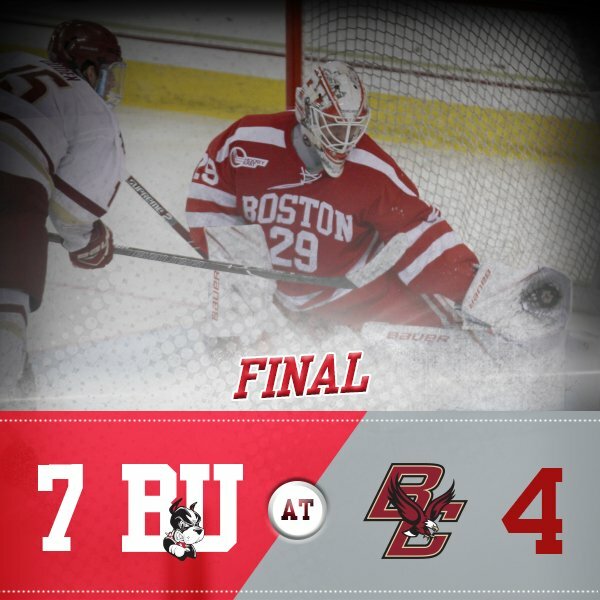 Terriers battled #2 Boston College to a 2-2 tie Friday afternoon at Conte Forum. BU captain Rebecca Leslie gave the Terriers a 1-0 lead in the final minute of the first period, with assists to Deziray DeSousa and Victoria Bach. The Eagles countered with a power play goal in the opening minute of the second period. Thirty seconds into the third period, Nina Rodgers converted the rebound of an Abby Cook shot for a power-play goal. Leslie also had an assist. BC knotted the score on an equal-strength score midway through the period to close out the scoring. Goalie Erin O’Neil stopped 36 Eagle shots. The teams meet again Saturday at Walter Brown Arena with puck drop at 3 p.m.